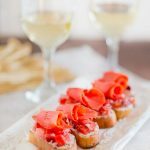 Smoked Salmon Crostini paired with Chardonnay wine is very easy to put together and perfect for a girls night in, entertaining or a game day appetizer. I love to spend time with girlfriends chatting about exciting things in our life – travel plans, good food, work success and just having fun. We always have such a great time together catching up, and laughing non-stop. 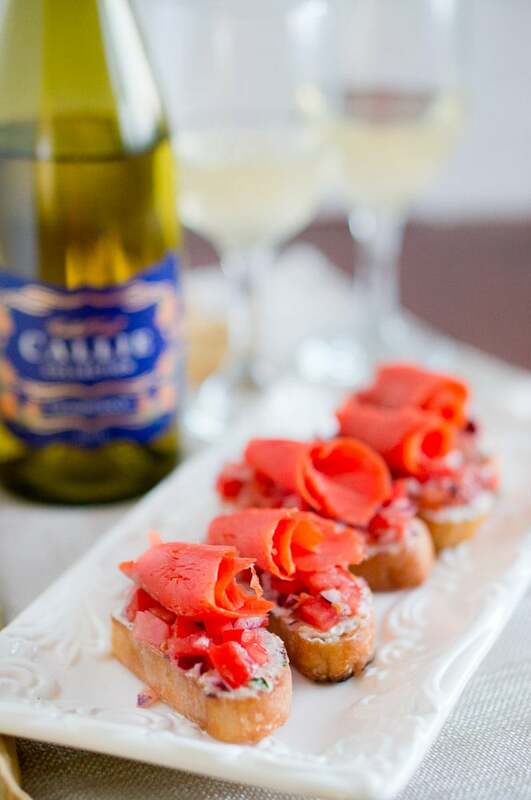 If you want a perfect night in, I suggest you prepare an easy appetizer like Smoked Salmon Crostini and pair it with your favorite wine. 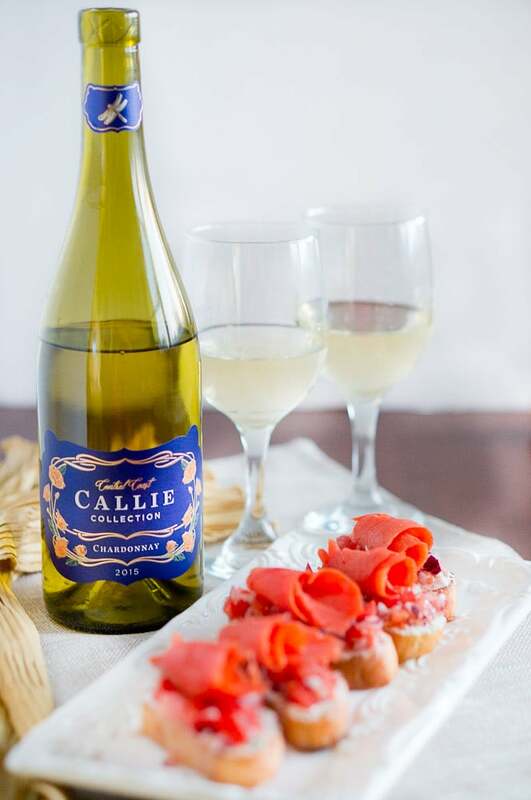 I recently tried Chardonnay from Callie Collection Wines. I loved the velvety taste with its citrus flavor. Callie Collection wines are sourced from the beautiful California Central Coast and they are easy to drink, have beautiful aromas, and fresh flavors. They are available in three varieties – Pinot Grigio, Chardonnay, and a Red Blend – so there is something for everyone. It also features a twist off/twist on cork (helix closure) which is really fun and provides sophistication of cork with the convenience of a screw cap. Crostini is an absolutely perfect appetizer – easy to put together and you can also make everything in advance and put it together right before serving. You can also dress up your crostini with various toppings and use different flavors. I love that you can create your toppings based on what wine you want to serve them with. 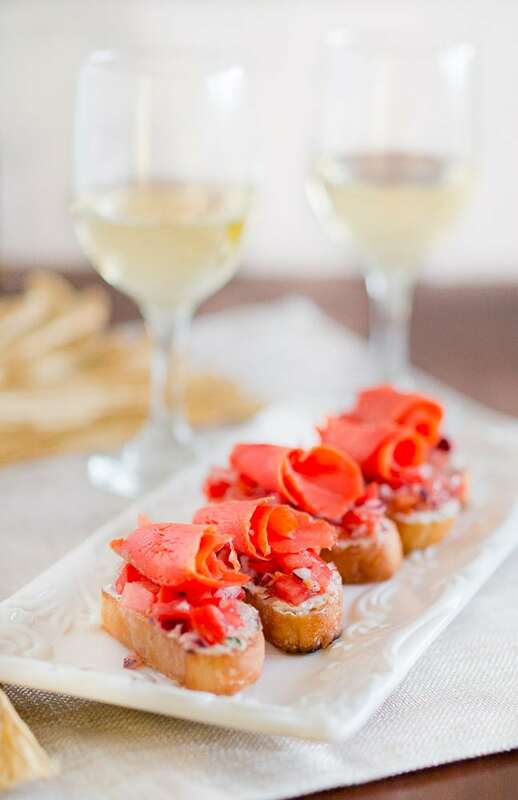 If you are entertaining, you can also create a crostini bar, and offer several different toppings paired with different wines – some of my favorite wines pairings for appetizers are Riesling, Chardonnay, Sauvignon Blanc, Merlot, and Pinot Noir. Based on what toppings you are serving with your crostini – fish, poultry, salads – choose a wine that complements your appetizer. Another great appetizer for parties is my Bacon Wrapped Apricots with Jalapenos or my Ricotta and Prosciutto Craker Appetizers. In a small glass bowl, mix together chopped tomatoes, red onion, 1 Tbsp olive oil and season with salt and freshly ground black pepper. In a separate bowl, combine goat cheese spread, chopped cilantro and season with salt and freshly ground black pepper. 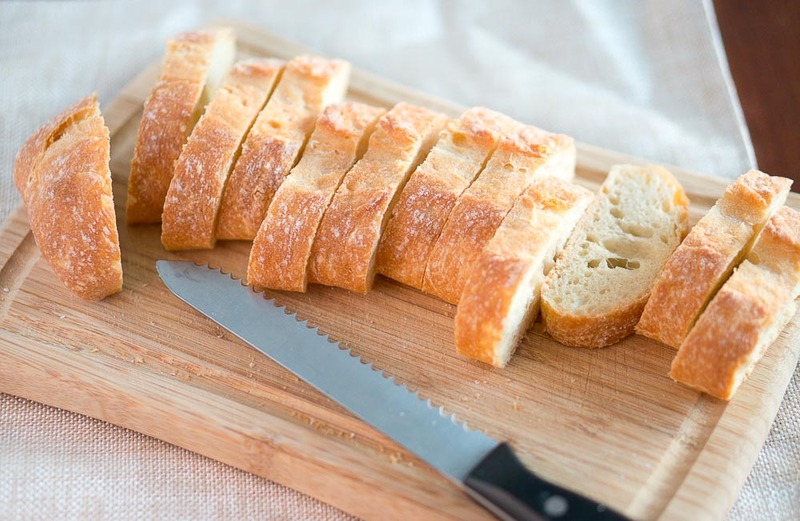 Slice the baguette into thin slices. Place slices in a large skillet over medium heat, drizzle with the remaining 2 Tbsp olive oil and toast the slices on both sides. 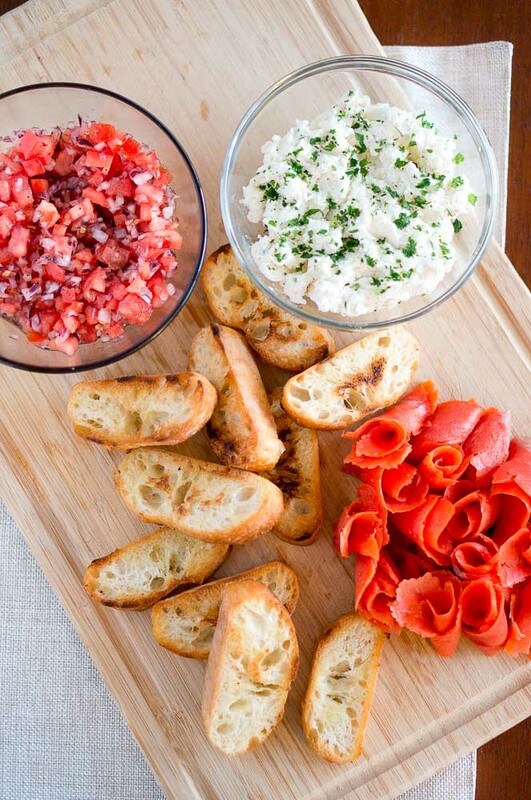 To assemble the crostini, spread the goat cheese spread on the toasted baguette slices, top with the tomato onion relish and finally top with the smoked salmon. Smoked Salmon Crostini - easy to put together and perfect for entertaining or a party. Delicious and beautiful appetizer for your next gathering. Wow, these look really good! I make something similar- a crostini with salmon and Bubbies sauerkraut. I love it, and I’ll definitely have to try yours! You can rarely go wrong with salmon! Thanks, Rhianon! I love crostini and experimenting with different flavors! I seriously love sauerkraut but never thought of adding it to crostini, i will have to try that next time. Love the flavor combination and perfect wine pairing. Great recipe to try on. 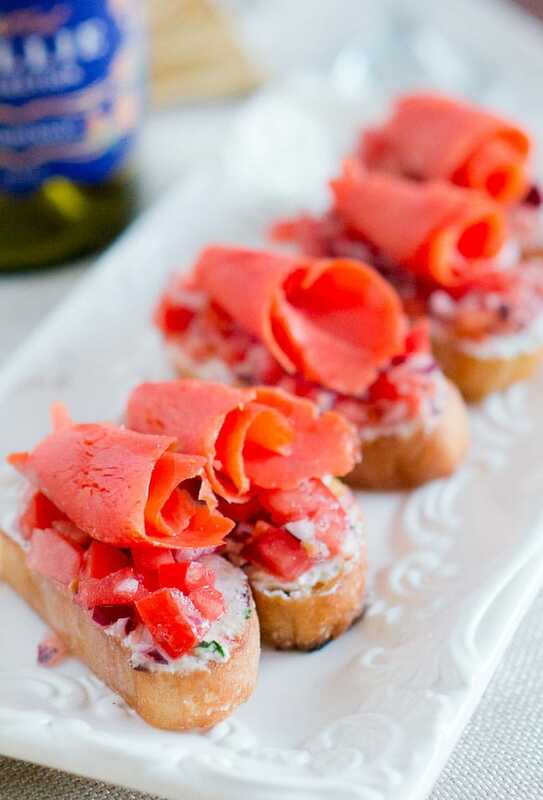 These salmon crostini look perfect for an elegant gathering! Interesting post with wine pairings. I’ve never had smoked salmon with goat cheese but sound good. Thank you! You should try it with goat cheese! It tastes great! Smoked salmon is one of my very favorites — we love it on bagels with a schmear or with the traditional egg, capers and red onion with lemon and a crust of bread! Now you’ve given me another way to enjoy it! Pass the wine! Oh my these were delish! Heaven!! I may have added one slight alteration to your (perfect) recipe, pickles! I’m a pickle-holic and had to add some of the pickles I have stockpiled (Cook’s Pantry if you’re interested). Thanks for sharing!